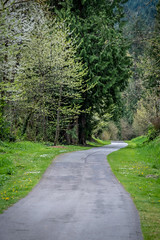 Since we have over 300 miles of trails available to us here in King County, it’s always fun to find new routes, explore new trails, and discover new loops to ride. Like many cyclists, we’re super excited for the 520 Trail to be complete. So much so, we thought we’d cruise out to see where they were in the process. It also gave me a chance to try out a new GPS mapping tool that I’ve seen. Check out our ride below (note that the last section from the 520 Bridge View Park to the Montlake Blvd exit was via a Sound Transit Express bus). And note the wrong turn where we missed the entrance to the 520 Trail and had to go back, whoops! Here’s a few of the beautiful sites from the trail as well. It was one amazing day for a bike ride. We also reached out to WSDOT and asked for an update to the 520 Trail opening, but they didn’t have any additional details for us. We’ll let you know when we hear something. Soon enough we’ll be adding this trail to our list and making the loop for reals! Next Post Skip the crowds at Mailbox and check out the new Granite Creek Trailhead. wait so is the 520 bike trail open then or not? It is not yet open. We’re waiting for a timeline update from WSDOT, though their page says “sometime this fall”.